Description: After 50 years of service in the original downtown church building, the congregation moved to a newer, larger facility on the edge of town. This M.P. Moller, Opus 8060 is located in Nevada, Missouri at the First Baptist Church. The architect made provisions in the new sanctuary for locating the instrument. Originally the chambers were a very tight fit. The pipes are now installed in two large chambers which makes servicing the organ a much simpler task. The only parts of the instrument changed were the wiring from the console to the chambers and some winding lines. The organ is used for one service every week and on special occasions. A technician regularly services the instrument twice a year. 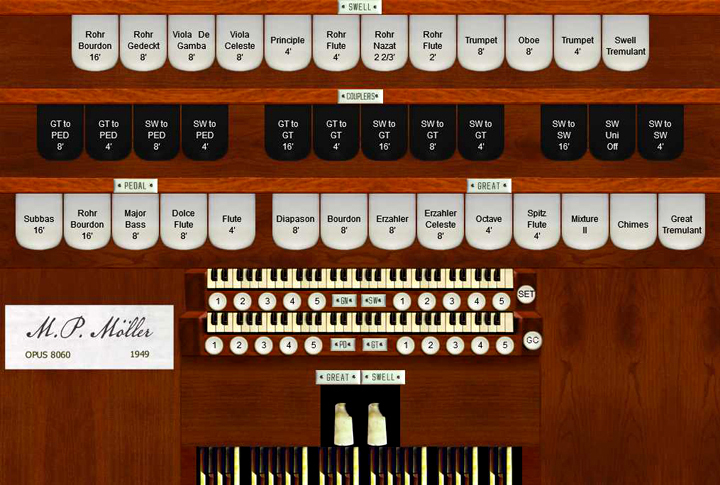 This is a straight organ with a unified Gedeckt (16',8', 4', 2 2/3', and 2') and an extended Trumpet (8' and 4') in the Swell division, and a few borrowed stops in the pedal division. The single pedal rank has 32 notes and is housed in the great chamber. The chests utilize a chromatic arrangement. It appears that the great chest was installed backwards into the new chamber to avoid a steel beam. We have compensated for this in the samples. The organ has been recorded note for note and virtually assembled in the same fashion with the ODF. We have replaced the original noisy 21 note chimes with a similar 25 note Deagan chime rank. Studio processing included seamless looping of each pipe sample (note by note), and critical noise reduction artistry to reduce the rumble created by the blower. Natural releases of each note were recorded and included for the best possible realism. We have created the Erzahler Celeste in the studio from the Erzahler samples as a special bonus. We have included five divisional presets and five general presets for a total of 20.